Archive published in the magazine Octopus in May 2013. "Amateurs of extraordinary diving and adventure, I found for you a real paradise on earth. A place where the clock stops, which makes forget all our hassles, which you will not want to leave. It is therefore with nostalgia that I write this article, accompanied by the enthusiasm to share this fabulous experience. In February we left (with Melanie my binomial life) for four weeks in Tanzania. The program was "simple": climb Mount Kilimanjaro followed by safaris in the region of Arusha, then end of the stay for a deserved rest in Zanzibar. 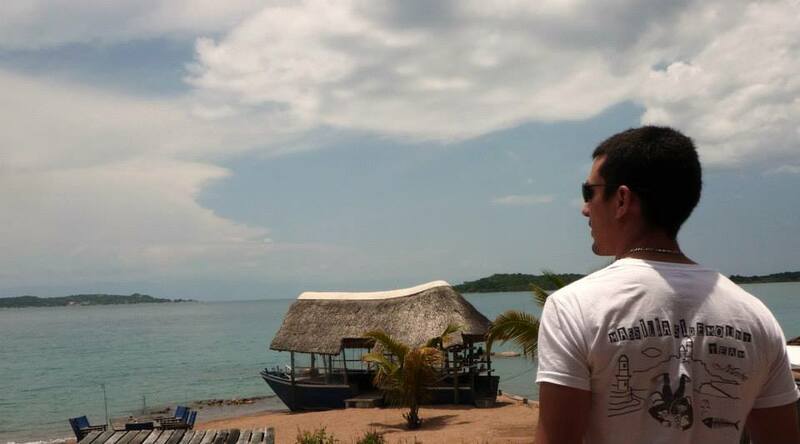 However how can we accept being in this part of the world without observing what happens under the surface of the mythical Lake Tanganyika when you are passionate about fish? For those who do not know its characteristics it is the longest lake in the world (660km), the second deepest with up to 1436m of water, it is located on the border between Tanzania, Zambia, Congo, and Burundi. 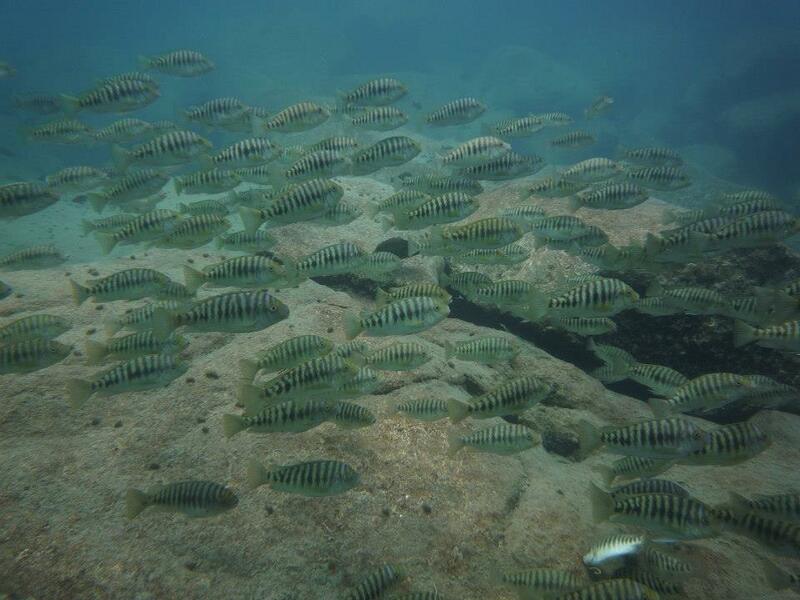 The most fabulous is that it is home to multiple endemic species belonging to the Cichlid group (98% of the 250 living varieties), whose colors and peculiarities are more amazing than the others. For example, the well-known haplochrominans, which incubate and shelter their young in their mouths in case of danger, and whose mode of reproduction in T is very evolved. We first had to find out how to get there and where to dive, which was no easy task, cost us a day of intensive and unprofitable research but we did not want to abandon it so easily . We therefore took a first bus, heading south towards Mbeya from Arusha (count 56000TSH or about 28euros per person, departure at 6h30 and arrival at 23h30). After one night in the bus parked in the parking lot we take a second one to reach Subawanga (count 17000 TSH / person, departure at 8h30, arrival at 16h if all goes well). At a destination with 2h delay due to bogging of the bus on the track, we found at Dadoo guesthouse (10000TSH in double room) sufficient comfort that we particularly enjoyed after this journey. And yes, after Mbeya the road is under construction, the portions of asphalt are still rare and with the rains it does not help anything. For dining in this town we recommend the Moravian Conference Center, or the country club a bit more expensive but which are good value (the Holland hotel has good reputation too but avoid the other places if you want to eat anything but rice With beans, chapatis, drinking sodas, tea or coffee if not at the risk of getting sick). The next morning we took a last bus (leaving at 10am, ticket at 10000TSH per person) heading for Kirando, we stopped in Katongoro. From there you will have to find a way to reach the banks of the Tanganyika, we decided to walk the last five km. Half an hour later a pickup stops and proposes to drop us off at Kipili, a South African engineer who works for road construction and who is going to the Lakeshore lodge for the weekend. This lodge is the only place to our knowledge where it is possible to organize its dives simply (in any case we had found no other place, or even only to rent equipment), it is the only center PADI of Tanzania on the lake. So I contacted the owners by email to find out if we could come and I had received a positive response in less than 24h. We are deposited with the Benedictine brothers who have a mission in the village of Kipili to get rid of our luggage in a small but simple room with shower and toilet (only 13500TSH per night for two). Then we take the trail that leads to the lake shore lodge to organize our dive for the next day. A short 20 minute walk is necessary to get to the other side of the hill. When you enter the property you feel like you are in another world, a real paradise, like in the postcards you collect on your desktop, or the wallpaper of your computer ... The staff composed Of inhabitant of the village, is very welcoming, in the image of their bosses Chris and Louise whose kindness impresses. A true haven of peace with its small beach of white sand, its "chalets" at the edge of the water. All environmentally friendly because here all the electricity is solar. So we get to know each other, we spend a little bit for the fierce ones who come solely for the purpose of diving and staying only two days on the spot. Especially when Chris a little annoyed announces that for the first time in seven years a crocodile rode in the vicinity, that he would have killed a child two weeks before at dusk and that a woman who was swimming was bitten The arm ... He assures us however that Jaspar a former diver-fisherman with 7 years experience that will dive with us is not worry because in the north of the lake where he worked he met several times without ever feeling in danger . He then asks us if we are really sure we want to go there because he does not feel like canceling himself when we have purposely made 3 days of bus. Without hesitation we confirm our desire to dive. Once the administrative procedures (counting $ 70 per dive all included, a big advantage to be specified is that we can pay by credit card), we indicate our sizes for the material (we only took our masks with computers , APN, and parachute). The appointment is fixed at 8 am the next morning. In the evening we eat with brothers Robert and Joseph who are extremely kind, the dinner is hearty, a prayer is made before the meal but they accept everyone what is a real lesson of life today. I will not hide their astonishment when they were told that they were there only to see fish, not even to catch them. In the early morning we arrive at the lodge, the boat equipped with twice 75ch is ready, the equipment is on board in bags identified with our first names, there is even a towel for everyone! Before the departure Chris tells us that the crocodile was seen in the night nearby, the police patrolled to kill him but did not find him, he wants to make sure one last time that we did not change of opinion. I ask Louise if it does not bother her that her husband comes with us and she replies that it is more dangerous to take the bus in Africa than to plunge into the lake. One last check on the internet: the attacks of divers seem extremely rare, it is ok we go there. We leave in the direction of the island opposite the lodge where a small fishing village remains. After 20 min of navigation we discover large blocks that spring from the surface. The water is magnificent, a big boat of divers-fishermen is on the spot, it's good sign because they would not be there if the crocodile had been seen. As we anchor a fisherman's boat, we are informed that the crocodile was killed and eaten the night before. This news is not to displease us. Chris gives us a great briefing, explains the main species we can meet and their peculiarities. Once equipped we put ourselves in the water. Immersion up to -6m for a bubble check and from then on we are amazed by the visibility which is at least 20m! Fabulous for a lake dive. On the first blocks of stone we perceive a multitude of these fish so characteristic. The colors of their dresses have nothing to envy their cousins ​​coral reefs. The Julidochromis Dickfeldi are really very elegant. It feels like an aquarium! One can see female Lamprologus Callipterus hidden in their shell and the male that moves them. These males make nests of shells of Neothauma by flying them to each other (with females in), these nests can have 200 shells, which is why they are called shellfish. 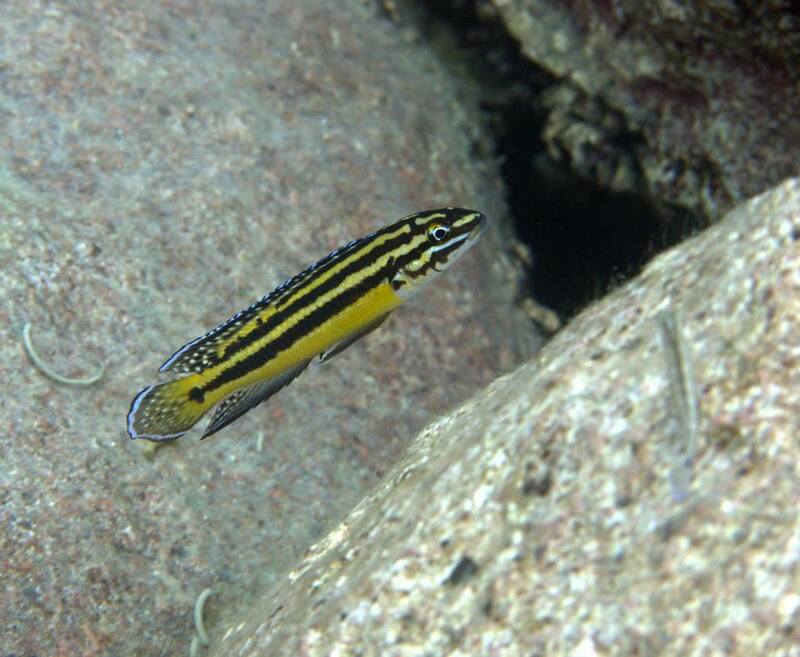 A small yellow eel spotted with yellow called Mastacembelus Moorii lives its life on the sandy bottom. She is magnificent. The intruders that we are pushing to hide behind a stone. We continue our tour around the islet. 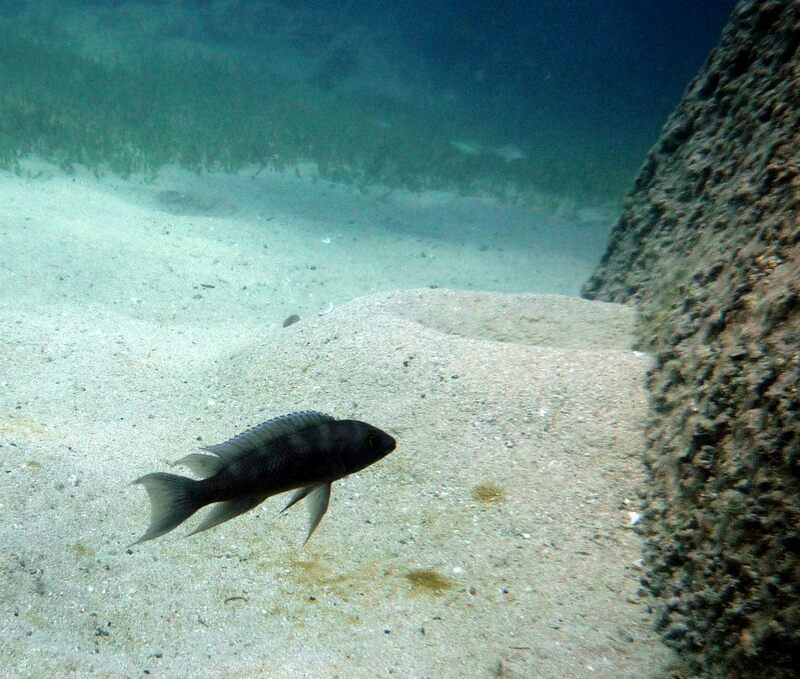 At 12m a beautiful Boulengerochromis microlepis, at least 50cm we study. It is the biggest of the cichlids, we spend several minutes contemplating it then we go down until 25m in search of huge cat fish that measure more than a meter, but this time we will not Will have the chance to meet them. Surprisingly, we are in a lake and in a small wet combination I'm not at all cold, normal the water is at 28 ° C, a real happiness. In the area of ​​15-18m impossible to err, we observe the famous Cyphotilapia frontosa with their bump on the head so characteristic, they are considered the kings of Tanganyika by aquarists. We pass through a maze of rocks and then into a small tunnel about ten meters long. We continue our journey accompanied by species all more intriguing than the others. What a spectacle to see the benches dance in the blue! We slowly attack the climb, needless to stay too long "deep" if we want to fully enjoy the show. The majority of the fish are so small, their size is less than 10cm on average, so lively and fearful that it is difficult to take pictures. There are so many, the multitude of species is such that one no longer knows where to head. We are not too much to three photographers in the palanqué to try to make some shots to share with you their beauty. Arrived near the boat we have 60 bars. Ok it's time to go up, we make a 5min safety stop. We are almost 800m above sea level and we do not want to take any chances. And then in 5m of water life is of such a breathtaking richness, that one does not see pass the time. Back on board after 64 minutes of pure happiness I have only one idea in mind: go back diving! Upon our return the midday meal awaits us (counting $ 30 for two), the quality is exceptional, we can not resist eating better than most French semi gastronomic restaurants in such a remote area. The lemon rice served with the fish was magical, not to mention pineapple granite ... We sat down with Chris, Louise, and our driver the day before. It is a very pleasant moment of exchange, Chris promises us a diving even more beautiful for the following morning on the banks of another island very close to the river. I ask him if we can fish on the lake and the departure is immediately fixed at 6 o'clock the next morning with the neighbor. In the afternoon we will see the ruins of one of the oldest churches in Tanzania within walking distance of the lodge. The view is breathtaking. We dine once more with the brothers and it is images full of the head that we fall asleep. The storm breaks out very early in the morning, impossible to get out. At 7 o'clock we go to the lodge, the fisherman agrees in spite of everything so that we go to soak the lines for an hour. The water is tinted and the holds will be small. It is nevertheless nice to learn their technique, the jig: they use a kind of palangrotte with silver hooks without bait, that they mobilize to the plumb of the boat from top to bottom and it works! I managed to catch 6 fish all at once! So we take care of the feet in the water, for my part by reading the last number of octopus bought before our departure from France to the airport. At noon we will still eat beautifully, a helicopter noise comes to animate this moment, the machine (a superb 6-seater machine) lands with its two pilots to spend the day here and continue its route the next morning. As we were not able to dive we were able to test for you a bandas at the lodge (expect $ 190 for two full board). When we discover our room, it's new emotional shock, the bed is huge, the sumptuous decoration, everything is perfect and thought to the last detail and taste. The showers and common sanitary facilities are remarkably splendid and clean. We are once again conquered. To digest we make a game of failure, then at 4 pm we decide to go and get our things from the brothers. Chris insists that we take the quad so that we do not get back late. Seeing us arrive the children of the village have joined us, so they were entitled to a little ride, what a pleasure to see their smile! For those not living in the south you can find out more at www.francecichlid.com. Thanks to Laurent BASSET for his assistance in the identification of species. The best period seems to be the low season in winter because in June of July the lodge is complete. Despite the rainy season you will be quiet, the water is hot and rainfall is not that high. The buses are spartan, the squares very narrow, and it is not uncommon to see chickens under the seats. A transfer in 4 * 4 can be done with the lake shore lodge to avoid the joys of the bus. Normally with the construction of the access road should be more and more easy. Turquish airway certainly offers the best fares to Dar Es Alam (from where you can get a bus or plane, the best option) and Arusha. It is possible to find air tickets between Dar Es Alam and Mbeya for around $ 200 one-way but at the moment it is more interesting to land at Subawanga. To be able to dive at the lodge you have to be certified because for the time being there are no frames, the equipment is in very good condition, there is a compressor and the blocks are 12l steel. An oxygen therapy kit is embedded on the boat as well as the safety equipment. The dives are done in complete autonomy which is very pleasant, accompanied nevertheless by Jaspar and / or Chris who will make you discover with passion the sites. It is even possible to organize with Chris the boss, a week on the shore of the lake, with the boat, the dive equipment, a compressor and tents in order to reach more distant or unexplored sites to leave The encounter of new species. His experience with a famous cichlid expert in these conditions is a real advantage. For non-divers there is something to look after, the beach is a very nice place to bask, boat trips can be scheduled, snorkeling, kayaks are rented as well as quads. Excursions to nearby national parks may also be considered. " 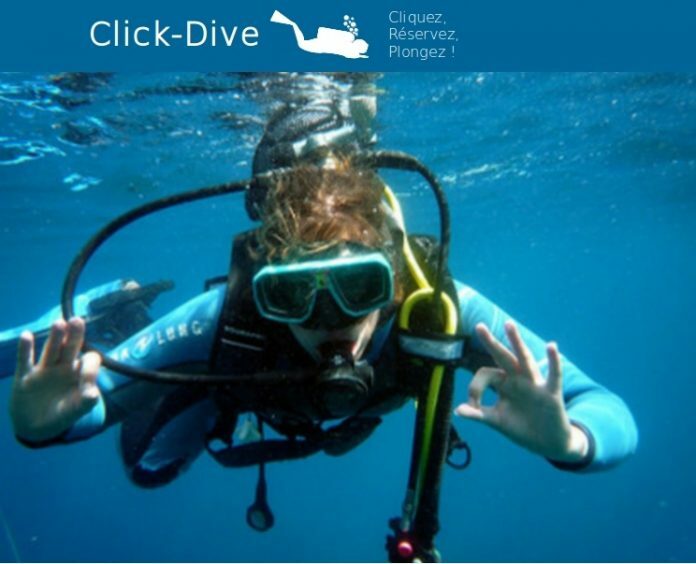 The Click-Dive team, a dedicated dive booking site, wishes you a wonderful dive.